What we know about Socrates is what his contemporaries – mainly his student Plato – wrote about him. Early in the Peloponnesian War, when Socrates was in his late thirties, he was an Athenian infantryman, and he fought in a few of the minor battles that Athens fought on land. He was recognized for his courage in battle and for his ability to endure the hardships of heat and cold, hunger and thirst. Socrates was an aristocrat, and after his service in the military he was able to pursue philosophy. He studied the art of debate and became a master at cross-examination and irony. He became a teacher, mainly for the sons of aristocrats, and without asking for money, which he didn't much need. Socrates (GFDL / Creative Commons). His view that no one knowingly did wrong was part of the naiveté of his time. Human psychology had not yet become a disciplined study. Socrates failed to rise above a habit common in his time: he took oracles seriously. But he did question Homeric religion and ethics. Like Xenophanes (570? - 475? ), Socrates believed that the gods of Homer were no guides for morality. Instead of the chaos created by the conflicting passions of these gods, he believed that the universe was guided by a god with a sense of purpose, a god that was the source of human consciousness and morality. 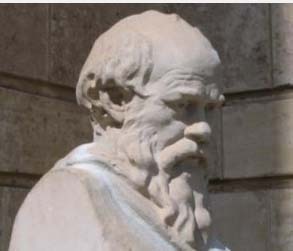 Socrates is described as hearing an inner voice that he believed was God's. This was not the god of Anaxagoras. Socrates, according to Plato, faulted Anaxagoras' nous (ultimate mind and soul, or God) as dead mechanics rather than a power with knowledge and design. Believing in a goodness created by God (rather than created biologically as empathy), Socrates believed that people needed merely to match that goodness. He believed that knowledge and obedience to truth improved one's soul and diminished the ungodliness of wrongdoing, confusion and ugliness. To help people gain knowledge and improve their soul he tried to expose their ignorance and mistaken reasoning, and he often started with the question whether they understood what they were talking about. Socrates believed that knowledge was enough to prevent people from doing wrong, that no one knowingly did wrong. He failed to understand irrationality as Bishop Augustine would, or consider it as Shopenhauer would. He wasn't interested in the mechanics of the mind as modern psychologists are, or the mechanics of other things. According to a contemporary, the philosopher Xenophon, Socrates called people fools for studying the mechanics of nature. Nature, Socrates believed, was part of the divine and the divine was about good intentions. The study of natural phenomena, Socrates believed, produced nothing practical. To many in Athens, concerned as most people were with the practical, Socrates was a babbler. The playwright Aristophanes made Socrates a subject in his play, The Clouds, and in this play a philosopher's meeting place burned, which the audience was supposed to enjoy and to care little if Socrates burned with it. Socrates is not known to have been politically active. He is not known to have spoken in favor of or against the murderous Spartan-supported oligarchy that took power at the end of the Peloponnesian War. But perhaps because Socrates had associated with many of the aristocrats who had supported the oligarchy that took power after the defeat of Athens in Peloponnesian War, or because many of his students had been against democracy, some members of the pro-democracy regime that followed that oligarchy held him suspect. Leaders of the new democratic regime had him arrested. They believed in the traditional gods of Athens, and they charged him with not believing the gods of the state, with introducing new gods and with corrupting young people with his talk. In court, Socrates admitted that he did not believe in the gods of the state, but he stated that he had not intentionally corrupted his fellow Athenians. He told the court that rather than prosecute him they should tell him what course of thought was correct. The court wasn't drawn into that debate with Socrates. It found Socrates guilty and suggested a sentence of death. If Socrates had requested a reasonable lesser sentence, as was the custom in Athens, he would have given the court an opportunity to reduce his sentence. He is described instead as having shocked the court with a defiant announcement that instead of being sentenced he should be praised as a public benefactor. He was standing tough. So the death sentence stood. According to Plato, Socrates announced that he honored and loved the men of Athens and that he would never abandon philosophy. As ordered by the court, Socrates drank hemlock and died – in the year 399 BCE, five years after the Peloponnesian War had ended. Then, because of the public hostility against those perceived to be enemies of democracy, friends of Socrates and others who felt endangered fled into exile.